Film, stage, and ballet designer Barbara Karinska was the principal costume designer and director of the costume shop for The New York City Ballet from its beginning until her retirement in 1977. Known professionally only as Karinska, she was born Varvara Zhmoudsky on October 3, 1886 in Kharkov, Russia. She ran an embroidery and coffee shop in her native Russia before emigrating to Brussels and then finally settling in Paris, France. During Karinska's brief career in Paris, she collaborated with a long list of painters and designers. 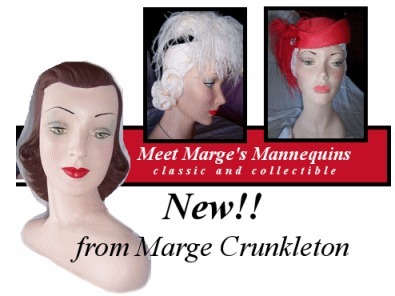 She costumed Les Ballets 1933 and six ballets for George Balanchine before moving to America in 1938. 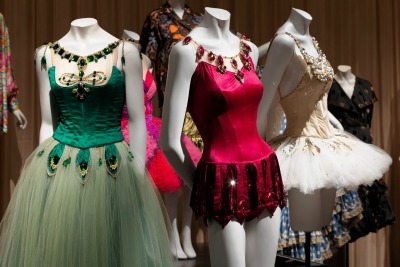 Barbara Karinska Costumes for New York City Ballet's "Jewels"
While working primarily in ballets, Karinska did design for Hollywood films. She won an Oscar in 1948 for her costuming of Ingrid Bergman in Joan of Arc. She worked with George Balanchine's company Ballet Society (later named The New York City Ballet) from its inception in 1946 until the end of her career. Karinska's innovative bias cut side paneled costumes allowed the dancers to move more freely. She was known for elaborate detailing on visible elements of the costumes as well as a small detail, such as a rose, in places only the dancer would see. It was said of wearing her costumes, "You just feel beautiful." Karinska is best known for designing the "powder puff" tutu that has become the classic design for tutus since its inception in the 1950's. The layer upon layer of tulle replaced the wired "pancake" tutu that often flipped up when ballerinas brushed against each other. Karinska was honored with the Capezio Dance Award in 1962 with the commendation that 'Costumes by Karinska' has become a promise of visual delight for the spectator and complete delight for the dancers. 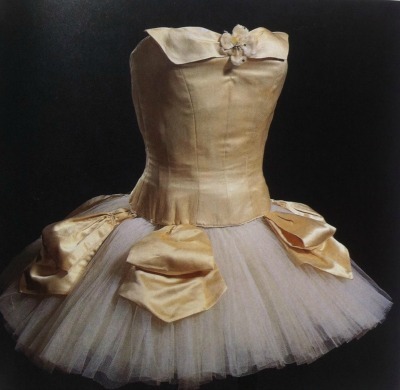 Karinska Costume for "Symphony in C"
In the ballet Symphony in C, George Balanchine said, "I attribute to (Karinska) fifty percent of the success of my ballets to those that she has dressed." 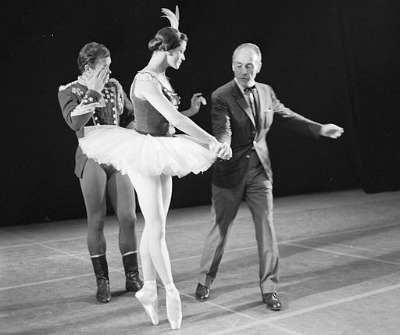 Karinska's final work was Balanchine's 1977 "Vienna Waltzes." Barbara Karinska died October 18, 1983 at the age of 97.